Thanks to a larger prism, a silver- (instead of aluminium-) backed mirror and a change to the optics, the viewfinder of the EOS 5D Mark II is brighter than that of the original 5D. This is helpful in the low-light conditions that the EOS 5D Mark II is suited to working in because of the very high sensitivity settings. The viewfinder eye point has also changed from 0.8 to a more comfortable 0.87, and the coverage has been boosted from 96% to 98%. One of the biggest problems with the original EOS 5D was that enlarged recorded images were only shown at relatively low resolution on the LCD screen and it was impossible to be certain if they were sharp or not. 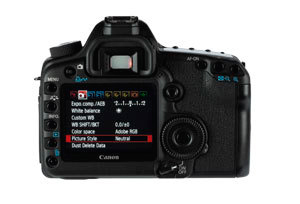 Thankfully, this has been addressed in the new EOS 5D Mark II. The LCD screen is now also larger at 3in, and has the same 920,000-dot (307,000-pixel) resolution as other semi-professional level cameras. The impact of this size and pixel count increase is immediately obvious, and images have much more definition than on the original EOS 5D. The screen also performs well when used to compose images, and the 5x and 10x magnification views enable extremely precise manual focusing. Although the LCD screen is fixed, it has a 170° viewing angle, which means that when the need arises it is possible to compose images on the screen when it is not directly front-on. As usual, though, it is preferable to have a direct view of the screen. Video recording is straightforward, but it is advisable to use the camera’s jack to connect a remote microphone to avoid the machinations of the AF and the wheezing of any zooming being recorded via the in-camera mic. There’s plenty of detail visible in the movies and movement flows smoothly, but the back-and-forth focusing can make the results look less than professional.